If you look at the total level of construction employment, you see that data that caused Bob Murphy to reject my hypothesis. Although housing construction was down sharply by April 2008, total construction employment had fallen only slightly. But that data has no bearing on my claim that the decline in residential employment contributed heavily to the recession. We need to focus on residential construction jobs. 1. Almost 40% of the job loss had occurred by April 2008, yet the national unemployment rate remained relatively low. Those workers mostly found jobs in non-residential construction, or other fields, or in a few cases returned to Mexico. 2. In mid-2008, economic forecasters were predicting fairly low unemployment for the year 2009, even though they already knew that housing starts had fallen much faster than housing employment. 3. In mid-2008 commercial real estate prices were still quite strong, despite the fact that residential housing had been declining for more than 2 years. No spillover was expected. 4. Then NGDP fell sharply after June 2008. Even if there had been no pre-existing subprime crisis, one would expect a sharp break in NGDP to severely depress the housing industry. Not surprisingly, it was after mid-2008 that prices began falling in non-subprime markets like Texas. Surely a big portion of the post-April 2008 housing downturn was caused by the fall in NGDP. Australia did not see a decline in NGDP, and did not see a housing crash in 2008-09, despite even more inflated prices. 5. So nearly 40% of the job losses had little effect on the national unemployment rate, and a big portion of the remaining 60 % were almost certainly caused by the drop in NGDP. How much of the rise in the national unemployment rate can be plausibly attributed to job losses in housing not attributable to a fall in NGDP? I’d say well under one percentage point of the more than five percentage point increase in the unemployment rate. What do you think? PS. I can’t get the BLS link to work, they are series CES2023610001, CES2023620001, CES2023800101, CES2023800201. This entry was posted on January 24th, 2011 and is filed under housing market, Labor markets, Misc.. You can follow any responses to this entry through the RSS 2.0 feed. You can leave a response or Trackback from your own site. The “how inter-related” question is more relevant than the “how big” question. What happened in forestry? What happened in the lumber hauling rail car industry? What happened in home furnishings? Finance & real estate, etc. began to shed large numbers of jobs as a direct result of the turn in the housing market. What other sectors were directly hit? Also, what kind of commercial construction projects were no longer viable, and what businesses abandoned commercial space? And how are these things inter-related at the margin — economically. Also, what role did the fall of the housing market play in the collapse of shadow money — and what move by the Fed or the Congress could have plausibly, sustainably, completely, avoided that problem. There’s a “how big” question for you that requires thinking economically in terms of recalculation. And I invoke the “no magic” rule. Biological scientists study causally inter-related phenomena in the field — I suggest again that economists would have a better sense of how all this works if they were familiar with how things are causally-interrelated “in the field”, via actual study of the phenomena in the field, doing case studies of how markets are inter-related during a boom and bust. “The “how inter-related” question is more relevant than the “how big” question. Great points, and it makes my argument that much stronger. Despite the big loss of construction jobs, and the spillovers into other fields, unemployment only went up from 4.7% to 4.9%. So where’d the 10.1% unemployment come from? How about a big fall in NGDP? Isn’t that what Hayek would say? Secondary deflation? What we are not agreed on is on the size and structural width and depth of the original boom / bust itself, and the limits of Fed & Congressional actions to eliminate it. I’ve simply been pointing out that an isolated focus on 6 months or so of layoffs in one subsector doesn’t come close to the unemployment effects of the ongoing Great Recalculation. Wealth effects of the housing bust alone had serious impact impact on non-residential construction — a poster child of this fact would be non-residential construction in Las Vegas, e.g. putting the massive Echelon casino project in mothballs. And this isn’t an invitation to go off on a tangent here. This examples is for illustrative purposes only. Don’t miss the issue here. Engaging in the wrong kind of non-residential construction is significant part of the recalculation problem here — it’s not simply an “aggregate demand” problem or a “not enough money” problem. Illusory wealth effects encouraged folks to spend too much money on gambling and conventions and out of town entertainment — the significant cutback of spending on this stuff by folks from the housing boom areas is relevant here. I still say concentration on actual construction activity is a red-herring and non-sequitur. If one focuses instead on new credit issuance and resulting debt-financed consumption based on higher house prices and an expectation of continued high appreciation, and then what happens when all the banks simultaneously shut down the home-ATM mechanism, you get a perfectly adequate model of why AD expanded and collapsed, consistent with observed changes in the savings rate – which declined to below 3% during the entire housing boom. The question about Canada and Australia needs some comparative analysis. What are their underwriting standards, what kind of “exotic toxics” like Option-Arms do they allow or prohibit? and how are they enforced? What are their rules for second mortgages, HELOC’s, MEW, etc.? Do they have full-recourse and low-hassle foreclosure processes? All of these things matter. I still assert that what we witnessed in the US was a dramatic deviation from historical lending practices and the introduction of new mortgage instruments (both in the prime and sub-prime market, I got an exotic-prime mortgage, for example), which flooded the sector with huge amount of new credit completely decoupling it from historical trends. All that new credit issuance (and low-or-no standards underwriting) raised prices, which raised consumption through wealth effect and MEW. The entire construction industry and all related industries *combined*, as a percentage of the total economy, is just peanuts compared to the scale of these much larger credit-based boosts and hits to AD. You lose $500B/yr. By late 2008 home prices had already seen their steepest declines. My in-law neighbor index was down 45% by mid 2008, and Case-Shiller (Miami) was down 35% from peak. What you are looking at are two effects, not simply one cause and one effect. The housing & credit bubble was massive and its popping caused the drop in construction employment and GDP falling. GDP falling did not cause the price of homes to fall – home price peaked far before GDP peaked. Scott/Greg – I think you both have valid points here. The danger of focusing too much on one or a few economic indicators is that the results are going to be distorted with regard to the big picture. The NGDP hypothesis does seem to take a variety of indicators into account, but I wonder how NGDP can be correlated to other economic indicators in order to prove/disprove its influence. I’m sorry if you’ve already covered this topic in previous postings, but a quick tip would be appreciated. 1) Do you believe in monetary disequilibrium? 2) Do you think its plausible that nominal shocks can have real effects? 3) If Yes to 2), do you believe that monetary disequilibrium is a nominal shock that can have real effects (i.e. massive unemployment)? THATS the fundamental disagreement. Everything else is a proxy for that discussion. So, lets have at it. Good point Scott. And you should probably add in residential real estate agents as well (although I’m not sure why you would include non-residential trades workers). But even if you do, the employment declines seen in all of these housing-related industries are dwarfed by the post-crisis declines in other sectors. Even if you sum all employment series that could even remotely be related to housing, you can’t get anywhere near a drop of 7.5 million. And I’m not sure how Bob Murphy and Arnold explain this. For that matter, I wonder how they would account for the fact that, after many years of steady production, Japanese ceramics output suddenly collapsed after October of 2008. Did investors suddenly realize the need for “recalculation” out of Japanese ceramics as well? I’d wager that a bit of genuine science-imitating field research would give us some feel for the answer to this question. (although “massive” is relative and vague, there are better uses of language, and I’d prefer a more helpful explication). No, this is _not_ the fundamental disagreement. You don’t speak for all the Austrians or even most of them, so this is not directed at you. Go peruse the comments to David Beckworth’s reply on mises.org, or comments to Bob Murphy’s various articles there on the issue – i would say at least 80% of commenters DENY MONETARY DISEQUILIBRIUM. So, i apologize if i don’t accept you as a spokesman for Austrians. Maybe only a subset of Hayekians. Why do you believe that so many Austrians saw this collapse well in advance as Walter Block shows here http://www.lewrockwell.com/block/block168.html ? Also who was able to predict this collapse using your theory? Horwitz, Selgin, Hayek and White are not monetary disequilibrium “deniers”. There are no “spokesmen” for “Austrian” economics. There are just economists trying to provide the best causal explanation of economic phenomena they possibly can. What we will have in deeply overlapping understandings, but not identical understanding. This allows for explanatory growth over time (see Kuhn). I like Horwitz, Selgin, Hayek and White. And I also like Bob Murphy but he continues missing the point like most commenters on mises.org and even posters. If LvMI is the “face” of the Austrians, then its a bad one when it comes to monetary policy. I guess its a sociological critique of “austrians” in general not some Austrian economists. Yes, they do, Hayek got a nobel prize for his work on the real effects of nominal shocks. Sure, and it can have other effects too. However /long term/ unemployment is /likely/ the result of things besides monetary disequilibrium. And yes, Hayek’s work was ,incidentally, on monetary disequilibrium causing real effects. No, no its not. Thats your disagreement with the Walrasians, not the Austrians. The fundamental disagreement between the Austrians and the Keynesians is in knowledge and what is possible (or even desirable) for central planners to do. The above was directed at Contemplationist. Greg, The non-residential contruction crash occurred precisely when NGDP fell. As did the housing downturn in non-subprime areas. That tells me NGDP was to blame. I see not evidence that would make me think otherwise. The Fed should not allow those events to reduce NGDP expectations. If it does, the crash is on the Fed. Greg, I’ve blogged many times that I don’t believe in lags. Monetary policy affects the economy almost immediately. In any case, your observation is not relevent to the argument in this post, as I am talking about employment, not construction. Mark, Thanks, But Bob is indestructable. Jim, I don’t want the “full picture” I am examining a very specific issue, the effect of job loss in housing construction on the national unemployment rate. I have literally hundreds of other posts that look at other aspects of the picture. Actually, GDP rose substantilally between 2006:1 and 2008:2. Bill Gee, I have many other posts showing NGDP was highly correlated with all sorts of other asset markets during late 2008. Contemplationist, That’s an issue that it’s hard to pin some people down on. They say “Fed policy did all sorts of horrible things.” But if you ask for monetary stimulus, they say “That won’t help at all. It’s powerless.” I should emphasize I am talking about the extreme Austrians, not sensible folks like Greg. Gregor, Yes, and to reiterate, it isn’t just that the number of housing-related jobs is realtively modest, it’s also that when lots of jobs were lost, the national unemployment rate hardly moved. Re-allocation was working. Dan, The Roubini effect. People who constantly predict disaster, and who are constantly wrong, suddenly look brilliant when disaster strikes. In 1930 the Austrian economists looked brilliant. Three years later they were discredited. No one, as the EMH says (asset market) disasters can’t be forecast. You say EMH can’t predict these outcomes and thats fine but the Austrians didn’t get lucky. They said why it was a bubble, how it would collapse, and what the fallout would be. I’m not saying Austrians predict every bubble in advance but it’s seems absurd to not acknowledge that these economists hit the ball out of the park on this one. I wasn’t talking about money. I was talking about the relation between residential construction and the forestry industry. Another domain where you invoke “And Then A Miracle Occurs” — i.e. instant and magical coordination? With respect to the forestry industry, it just so happens I have the numbers. These were true as of August but I don’t think things have changed that much. -employment by state and local governments is down by 127 thousand. All I can say is Thank God for logging, mining and the internet. Has a single economist done field research on this? Dan “could?” “might?” I also made exactly the same prediction. In the 1990s I constantly warned that fannie and freddie were ticking time bombs, that “might” go off. Greg, I’ve never denied that recalculation creates some unemployment. It raised unemployment from 4.7% to 4.9%. The debate is about magnitudes. 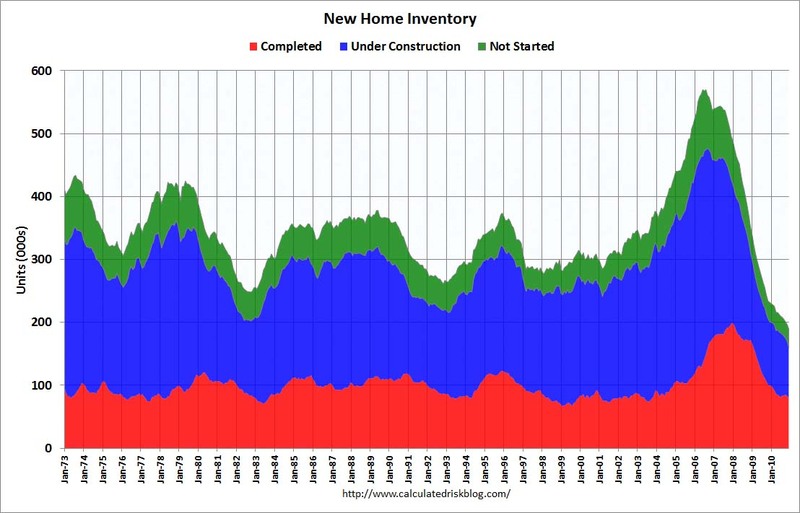 On that graph, since not many homes are being built, the new home inventory gradually declines. But total vacancies are stable, as the fall in NGDP reduced housing demand. We must not be looking at the same graph. greg, Yes, I saw it, what’s wrong with my answer?